While Q2 GDP data weakens USD, positive building permits report supports NZD. 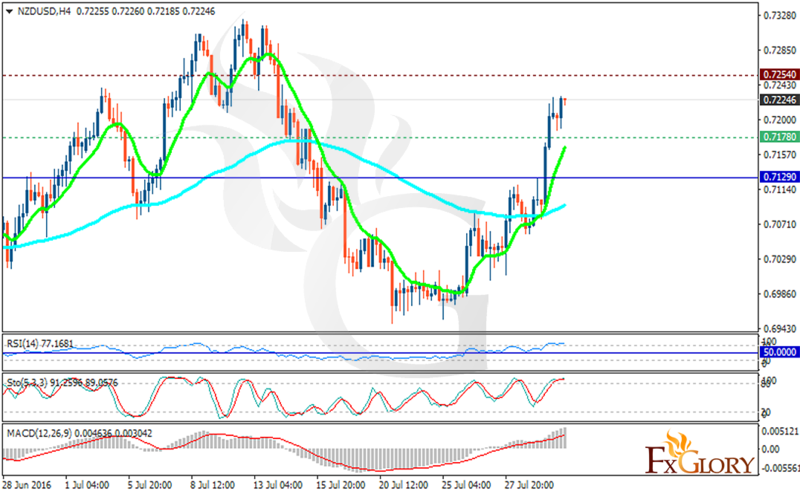 The support rests at 0.71780 with resistance at 0.72540 which both lines are above the weekly pivot point at 0.71290. The EMA of 10 is moving with bullish bias above the EMA of 100. The RSI is moving in overbought area, the MACD indicator is in positive territory which might fall down at any time soon and the Stochastic is showing downward momentum. Currently the price is rising but it would not for higher than 0.7250. Stay long for now but ready to sell at 0.7250.